Folding furniture is the best solution for small dwellings such as studio apartments, one-bedroom city flats and vacation homes. The key to maximising them is choosing flexible, transforming furniture that makes the walls work hard. A wall mounted bed that fold down, a desk that turns into a bed and other multi-use furniture items will help you to make the best use of space, while combining functionality and aesthetics. The growing shortage of square footage in new homes urges us to become more space-conscious and to design and create multifunctional solutions built according to a logic of "good design". 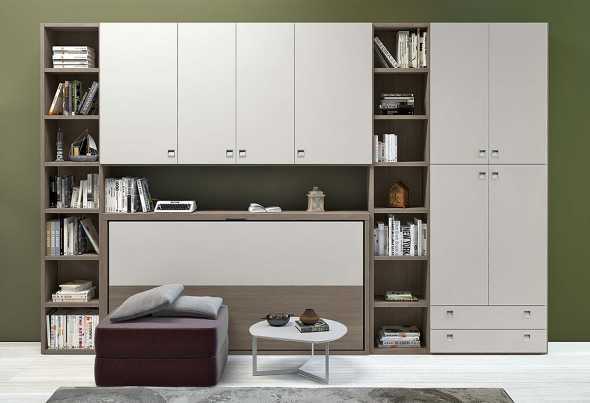 To meet the challenge of multi tasking furniture pieces that are both beautiful and clever, compact has to rhyme with versatile: a sofa must function also as a bed, a wall double bed can include a dining table and a wardrobe, a bed and desk combo can be complemented by bookcases and storage units. Space-efficient furniture has to work for you and your family, making life inside your home easier and more enjoyable, no matter its size. Sleeping, cooking, eating, studying, relaxing all in one room, can be challenging. If you need a multi-purpose piece of furniture is because you most likely need to save up on floor space. City dwellers, students and holiday cottage owners know all too well how important is to carefully plan and select what you really need. Let's start from the larger item: with its wide horizontal layout a bed is the element that more than any other takes up a lot of floor space. 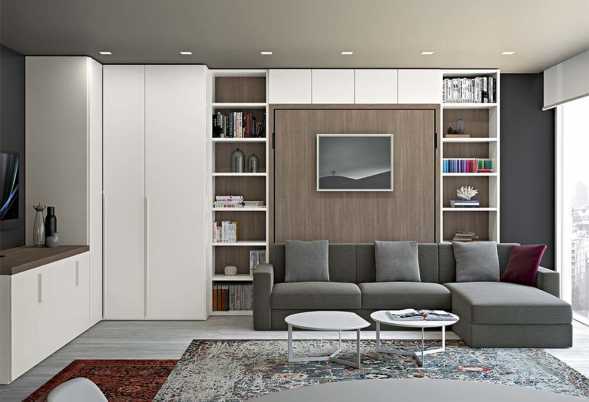 An ingenious murphy bed with sofa allows you to transform a living room into a bedroom in a few seconds, getting rid of the cons of normal sofa beds and folding beds. With a high quality wall bed sofa you can finally say farewell to uncomfortable low mattresses, pointy springs, ruined sheets and clunky mechanisms. The most innovative living room furniture for small spaces deliver both a stylish Italian sofa and a comfy sleeping nook. Easy to open and close, it'll deliver all you need to change the way you use your house, adding extra room while taking up little space. Combine these sofa wall beds with storage cabinets and shelving for truly a complete day & night area. Studio apartments are the best choice for those who prioritize location over square feet. Although small, one-room apartments are ideal for those who want to live in vibrant metropolis close to universities, subway stations, business districts, cultural venues and nightlife, while staying on a budget. But even the tiniest house has infinite potential if intelligently furnished. If you live in a studio apartment you may want to study or work from home, therefore you need a workspace. In this case go for a clever design such as a murphy bed with drop down table. A desk that turns into a bed or a wall bed-dining table combo will give you all you need for working, studying, eating and doing your DIYs. A modular solution is the best way to organize your home, combining worktops, relaxing areas, tv stands, shelves and storage units in a compact yet space-efficient furniture system. Don't stop at pictures: space saving furniture is customizable to suit your space and needs. Browse through product pages to find ideas and solutions, then contact us to find out everything you need to know about our Italian convertible furniture, prices and designs. Dynamic Day #1 is a living room furniture with wall double bed and built-in sofa with chaise longue. It includes two bookcases. 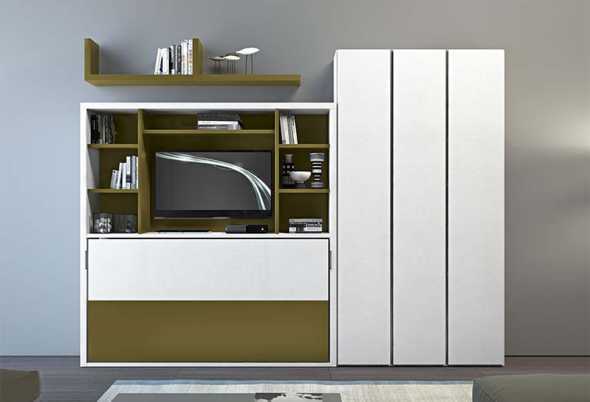 Dynamic Day #10 is a wall system with hideaway bed, TV compartment and wardrobe with three doors. Also with bunk bed. Dynamic Day #12 is a living room with wall bunk bed and TV cabinet with wall units. With this set your living area can be easily transformed in a bedroom. 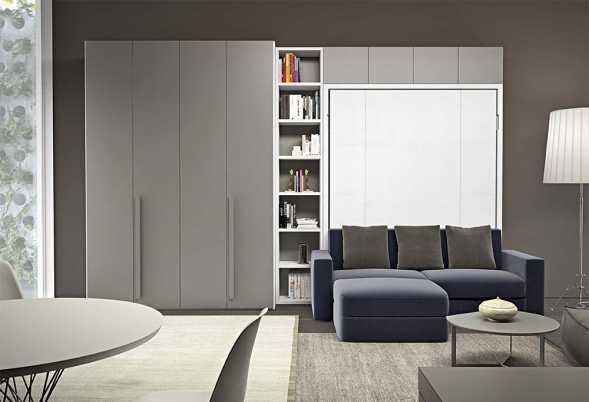 Dynamic Day #2 is a living room composition with murphy bed, sofa, wardrobes and bookcases. Ideal for a one-room flat. Dynamic Day #3 wall system with pull-down double bed. Different purposes in one furniture: wardrobe, bed, sofa. 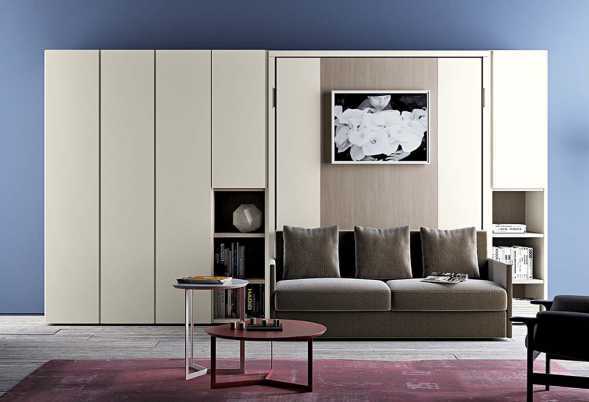 Dynamic Day #4 is a convertible wall system with murphy bed, sofa, wardrobe, bookcase and overbed unit. 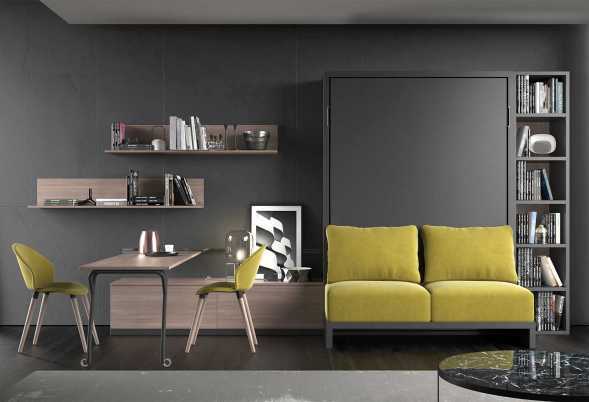 Dynamic Day #5: one-room flat furniture set featuring a wall double bed, folding table, TV cabinet and bookcase. Dynamic Day #6 is composed by a hideaway bed for the living room, with folding dining table, bookcase and wardrobe. 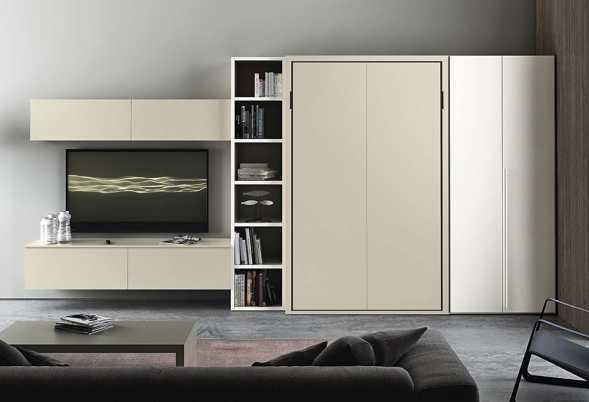 Dynamic Day #7 is a living room with wall bed, wardrobe with two doors, bookcase and wall mounted TV stand cabinet. 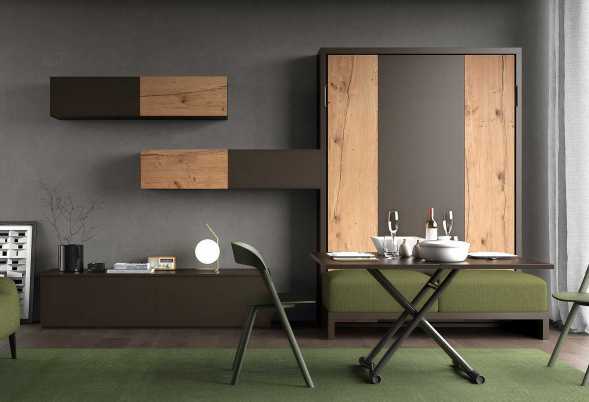 Dynamic Day #8 is a wall system composed by a bookcase with a wall bed and wardrobe with drawers. 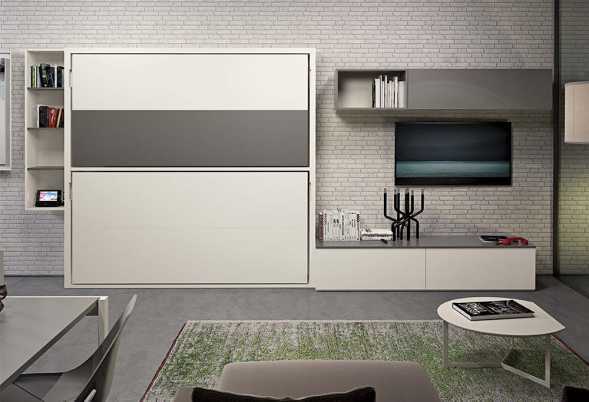 Dynamic Up #10 is a wall system with wardrobe and murphy bed, TV stand and shelves. Also with optional desk. Dynamic Up #13 is a living room with foldaway double bed, bench with cushions, convertible coffee table and wall system. Dynamic Up #14 is a day and night equipped wall, with table, sofa and double murphy bed.